Adventure programs, first written on company-owned mainframes, are nearly a quarter of a century old. Originally written in the sixties for the amusement of the computer wizards who ran commercial data processing installations, adventures such as Colossal Caves and Adventure were run late at night, when all was quiet and the operators wanted something to amuse themselves with. These programs occupied megabytes of storage memory, offered no graphics and could only be played by computer staff when time on the system could be spared. Scott Adams — who lightheartedly describes himself as a ‘grandfather’ in the microcomputer industry (he is, after all in his thirties) — is regarded as one of the founding fathers of micro adventuring. Scott Adams wrote the first adventure for a micro, and founded Adventure International: the oldest company selling adventure programs retail. Around half a million Scott Adams programs have been sold to date worldwide and he is currently working on a series of adventures based on Marvel’s comic characters. Hulk and Spiderman, his two latest adventures for the Spectrum, are the first two in the Questprobe series, which will expand at the rate of 3 or 4 programs a year and run to over a dozen titles. Both have been CRASH Smashes, and so when we heard that The Man was in the country, we had to go for an interview. This early interest in computing developed into a profession after taking a degree course in System programming, and soon Mr Adams was captivated by Colossal Caves and Adventure. ‘I saw the games on a mainframe, and I was fascinated. I owned a Tandy Model I and thought ‘let’s see if I can write an Adventure type game on the TRS80’. I didn’t listen to the people who said it would be impossible to get a program which existed on megabytes of storage into a 16K machine. ‘I didn’t try and take the existing program and put it into 16K, but sat down and wrote an adventure language of my own for the machine — an interpreter — and proceeded from there to write an adventure in that language. As a system programmer I know how to write tools. The first tool was the adventure language, the second was the interpreter to understand language and the third tool allowed me to develop a database for the interpreter to understand. The Fantastic Four Parts I and II will be the fourth and fifth adventures in the Questprobe series, with Part I introducing the Torch and The Thing (a Hulk type character) and Part II bringing on the other two characters. Both adventures will be written entirely in SAGA Plus and Scott Adams is confident that the Spectrum versions will have all the features of the disc-based programs written for the larger micros, such as the Apple. 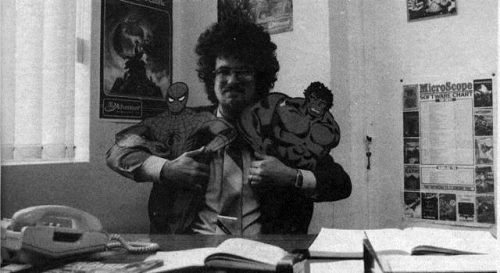 Hulk was written in his original adventure interpreter, while Spiderman was written in the original language and upgraded using some SAGA Plus features for tape-based micros. Expect to see Fantastic Four Part I around June this year. How do Hulk and Spiderman fit in to the scheme of his adventure? ‘I wrote Hulk as a beginner’s adventure deliberately. I put a lot in there aimed at people who had not played adventures before. Because of that I lost some of the complexity that I would have like to have had — which I was able to put back with Spiderman. I would have liked to have written Hulk to be for the experienced Adventurer, or medium experienced, but it wasn’t fair... a lot of people would have been buying Hulk who had never bought an adventure before, because they like Hulk as Hulk. ‘What I had to do was put enough stuff in Hulk so that an experienced adventurer couldn’t sit down, play it for half an hour and be done, but also enough breadth so that a complete adventuring novice could sit down and play it without getting hopelessly frustrated. What about graphics — the original adventures were text-only, and some adventurers feel that graphics detract from the game, and indeed take up valuable memory which could be better used; others feel that graphics add a great deal to their enjoyment of adventures. ‘I’m on both sides. I write all my adventures as text-only, to be played as text-only. As I’m writing an adventure I say ‘It’d be nice if we had graphics here to give a special effect,’ and I put hooks on the game. ‘Then graphics are added on for those machines that will support them; one thing I insist on is that all my versions support the Graphics OFF switch for people who don’t want the pictures. My adventures can all be played text-only because you don’t lose anything... there are no hints or clues in the picture which do not appear in the text. The graphics are purely illustrations, that’s all they’re designed to be. So how do you set out to write an adventure? ‘The first thing I decide is ‘what’s the theme’ — obviously with the Marvel adventures that’s fairly simple; then I decide whether I want a treasure hunt or a mission. If it’s a mission — what is my mission? If it’s a treasure hunt then it’s usually easier to write, you don’t have to be as serial in what you’re doing. Then I start putting in locations and start thinking of the problems that I’d like the player to overcome and some of the ways I’d like to see him solve it. ‘Some of the more wicked things I’ve done is put in a problem that might have seven or eight different solutions, but when you get to the end only one solution was allowed. It’s a matter of balancing. Sorcerer of Claymore Castle was unique in that respect. You’re casting spells and you can use spells for a lot of different things — for example one spell might open any door; the trick is to find the right door to open with it. And there we had to leave it. Mr Adams had promised to do some shopping in Birmingham city centre that afternoon, and as a good father couldn’t let his daughter down.